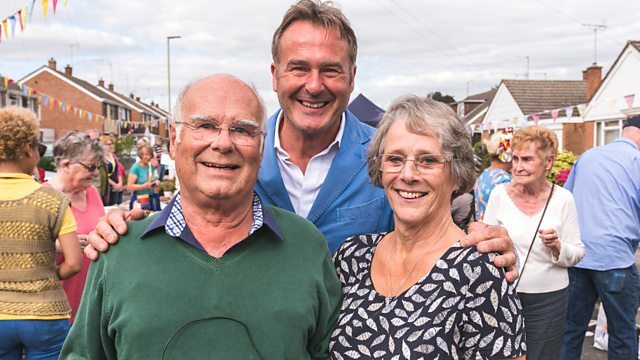 Presenters Paul Martin and Tim Weeks collect unwanted items in Hucclecote, Gloucestershire, to raise money for an amazing couple going through their own medical drama. Browse content similar to Hucclecote. Check below for episodes and series from the same categories and more! Many of us live on estates like this one all over the United Kingdom. we never really get to know our neighbour. is coming together for one massive fundraising street party. that do so much for others. we just wouldn't be able to fundraise. They're amazing. They do things that keep it going for the rest of us. It's their way of giving back. If you've got a positive mind, you can do anything. They carry on helping despite their own struggles. It was a do or die situation. You can never be anything but forever grateful to the donor. And now, there's more devastating news. and this time the donor is a lot closer to home. Most of the family were tested but Mum is a match. She's given him the ultimate gift, hasn't she? She's a bit of a hero, really. to raise the £900 we need to buy them a unique present. That is brilliant, are you giving us that? This street party is for them. And the great thing is they have not got a clue. And how will they react when they find out it's all for them? All of this is for you. This is your party. like Chris and Steve Sire. to say a big thank you to a local unsung hero. But they're completely unaware that all of this is for them. Chris and Steve met when they began working in their first jobs. And now they've been married for more than 52 years. She was the young lady that kept walking up and down the corridor. -Once we met up, we clicked, didn't we? Dad's very soft and very gentle. I think Mum's, she's the one that drives them forwards. They're just...perfect, I've got perfect parents. a few years into the marriage. right up until the start of the New Year of 1984. "I reckon I've got the flu coming or something." But it soon became apparent this is not just the flu. There was something seriously wrong with Steve's heart. And we went to see the consultant in the hospital. "a black bag is unlikely." And there he was. You were so poorly, weren't you? to have a heart transplant. I think you feel like that for evermore. For Steve, it was a second chance at life. As soon as he became fit, he started running, he started biking. for the work of the British Heart Foundation. £1.7 million over the 30 years. heart transplant patients in the country. But he's now facing more surgery, he needs a new kidney. because of his age and all those sort of underlying factors. So most of the family were tested but Mum is a match. She's a bit of a hero, isn't she? "How can you say thank you to her?" I said, "Well, I shall have to go on loving her for evermore, won't I?" well enough to join in. a unique and very personal gift to mark the occasion. A sculpture commissioned just for them. a meal in a fancy local restaurant for when they're fully recovered. But to raise the £900 we need, we're going to have to work hard. on the bric-a-brac stalls and on the pop-up rostrum. we'll send it off to an auction house to try for the big bucks. It's a good job I'm not alone doing this. I've asked toy expert and auctioneer Tim Weeks to give me a hand. -We've got our work cut out today. -I'm pumped up, ready to go. We're going to knock on all these doors in this neighbourhood. and Stephen has gone through so much in his life. -very successful but now he needs a kidney transplant. -And guess who's going to give him the kidney transplant? doing so much work around here in this community helping others. -Shall we go this way and that way? 'So, there's no time to lose. -It's certainly peaceful around here. -I love the signs they've got. So quiet, isn't it? You notice anything that moves in the street. In fact, the only noise I can hear is us! -Are you, you're not looking for antiques, are you? I'm looking for anything right now. Anything that makes money. -My other half in here, you can have her, she's antique. At least the locals have a cracking sense of humour. Alan's delightful wife Sue has found something for me. -It is an old picture. -Somebody like might like it. -That's what we call a furnishing picture. -Because it fills a big wall. Well, that's the first item of the day, a big, bold floral print. That's sure to make us a few pounds on the bric-a-brac stall. for our street auction too. Talking of streets, it looks like Tim's stopping cars now. -She lives up the road. -OK, I'll meet you at the shops. They're up for it, I can tell, this is going to be great. So let's go see what they can find. That sounds promising from friends Sophie and Sophie. Shame they didn't give you a lift, though, Tim! I'm taking a more leisurely walk down to John's tool shed. I can open these drawers, there is... It's awful. -Do you want me to give you a hand? Does it take this long with all your customers? God, he's a genius, this lad. There's a few there, look. 'the decorative profiles found in furniture and picture frames. We'll have the mice droppings! -Oh, the boss is here! Just going to wash my hands, get the mouse droppings off. Oh, the one you'll do with Paul Martin? He's more handsome, I think, really. He's a handsome man, isn't he? but overall, that is in pretty good nick. -You've hardly got on this at all, have you? -It's not that old at all, over a year old, I think. -And it's going to a good cause. Now, I'm really cheeky, so that's really generous of you. But what else have you got? he's working hard for these donations. Something that could be interesting here. -It lights up, it looks fab. -Yes, you can have that. -Fantastic. How does the song go? And that's music to my ears, much like this. -Joy, pleased to meet you, Joy. That's a great name because you're bringing me happiness and joy. -I've got this very old sewing machine. -Oh, is it a Singer? It's a Frister Rossmann. It's very old, almost antique. 'Well, it's not quite 100 years old but it's definitely getting there. And it actually does work. I think if I pull this out, sorry. -It actually does work. It's very antiquey. I like the fact that the case, look, has been made by craftsmen as well. Its box. You can see that, it's got a quarter veneer walnut on the top. -But look at all this, this inlay. -What do they call that? It is marquetry, yes, you're right. But because it's geometric, you could also call it parquetry. to take a look at this. Rare sewing machines are collectable. Now, it looks like Tim's stumbled on a garden clear out. He's bagged a full patio set there. New, this would cost at least £100. And it looks like Nigel is wanting his garage cleared too. -anything and everything is up for grabs? I can have a good old rummage through. Can I get stuck in? -OK. Let's see what we've got. -Can I go back to where I was? -You just want to leave me? And I can take whatever I want? -And I'm not going to get in trouble if this is empty? -Thank you so much. What a star. Thank you. All the best. Cheers, sir. get what I want, I'm on a winner here. but it looks like he may have found some quality in there. which is so in vogue at the moment. Everybody wants a bit of Ercol. but now everybody's looking for it. people will see the style that this has got. It's a lovely size. retro Scandinavian furniture is very much in demand. but this one's not Ercol and it's got damage. So I think this is destined for our bric-a-brac stall. It might still get us a few pounds, though. Tim's sitting pretty after that haul. and find out as much as I can about them as possible. Basically, be nosy, but don't get caught out. So wish me luck. -Oh, good morning, it's Paul Martin from the BBC. -Did you get a flyer through your door? Great. Have you got anything? What's your name, by the way? Steve, thank you very much for helping out if you can. We've got a 1964 kitchen table. Formica topped. Is that because you know it's 1964? You bought it in 1964? -It was a wedding present. -That was the year we got married. Was it a wedding present? I'd love that, because that's really retro and in vogue. -Are you sure we can have your wedding present? -Who bought you that, then? 'A beechwood kitchen table with a Formica top. 'I'm going to pop this one onto my auction. -So, what do you do in your retirement? -I've not heard of that. -So what do you do for them? -Fetes, those sort of things. -So you collect and stuff and do fundraising for them? -How long have you been doing that? -On and off for 28 years. -Do you want another story? -It's 32 years since I had a heart transplant. -So that was right in the early days? -Not one of the first, were you? -Number 87 at Harefield Hospital. And on 2nd August, I get a new kidney from my dear wife. -You've got kidney problems as well? -And you're donating a kidney? that will be about our first, we will be out there with you. Oh, thank you! Well, look, don't push it! I mean, crikey! It gives us something to look forward to. We're not allowed to hang around in bed, we've got to get up and walk! I've got lots of doors to knock on. -I know you're really busy. Good luck with the operation. Good luck. And if I do see you there, it'll be a lovely surprise for me. If we're home and we're well enough, we'll be out there, don't you worry. Wow! Wow, what a happy guy! And what a lovely couple, so in love with each other. That's how every, every family should be, have parents like that. but they didn't go through anything like that. Looks well on it, doesn't he? Yeah, we've got to do this, we've got to do this for them. because they have no idea this is about them. the local charity that Chris and Steve do so much for. or terminal illness, and they're reliant on volunteers. putting their time and effort in. I didn't know anything about it till I had him. But it's really been a great help and support for us. He loves it here. It's amazing what they do. he knows he's coming. Don't you? Rhea, the volunteer coordinator, knows the couple well. They help out with all of the events that we do. They organise all of the donations that come in. So, what do you know about Stephen's health? ..Chris is donating that and I think that is just remarkable. but they carry on regardless of this hell. But they are dedicated couple, they really are. is helping more than 90 local children and their families. It's good to help people that are less fortunate. "I'm so glad I've only had a heart transplant!" in a few weeks' time. So right now, we need to get busy. and it looks like Tim's got big ideas for a Mini motor. Tell me about this, then, this is yours, obviously? -This is my baby, my pride and joy. who live just around the corner. What are the chances of you bringing this baby on the day? -We could have 10 there. -Well, I'll try my best. -That would be amazing. Thank you. turning up on the day, that's going to be really, really cool. Good job, Tim! Hopefully that'll get the crowds motoring in. -Oh, are you an artist? I'm a dabbler, like so many people. That is brilliant. Are you giving us that? I said, he has visions of me going out in the country. You know what they call that, don't you? So pretty well it's brand-new, apart from the cobwebs. Do you know what, it's in mint condition, isn't it? -I know you like a bit of wood. and I can see that's quality throughout. You open that up, it extends, it's got a tripod base. It's got space inside for all your brushes and watercolours. Any budding artists would love to get their hands on that. New, that would cost between £100 and £150. A really generous donation, and that's not all. Betty's also giving this print of 18th-century Gloucester. It's local history, isn't it? So, you know, we need to sell it here. -Look, you've been really generous. -This, for me, today, is our star item. -It's all down to you. Well, that's some real quality for my line-up. If Tim wants to catch up, he's going to need to get his skates on. We'll have a proper look at this one. I think Tim is gearing up for another garage clear out. that'll retail at around £150 new. But the jacket probably could've stayed on for that one, Tim! Well, I've come to the right door here. Michael's already found me two pieces of furniture. A smoking cabinet and an Edwardian occasional table. If you don't want these, we will take them from you. 'And he's got a stool in the shed I can take too. we can upcycle that, paint it a bright colour. That just needs got gloss black, ebonising. so all of that impression, all of that cutaway comes out gold. That will look great, and then varnish it. make it like a nature cabinet. Well, Tim's primed and ready again in front of a garage. they've been so generous. I'm missing an item of quality. So I'm looking at you as the day is drawing to a close. -You can't have what's here. OK, so I can't have this. Is it a treasure chest? Oh, wow! Crikey. No, Tim's not interested in motorbikes. And do you have them out on display? -Or are they all in there? -No. They're in the house. This is the end of the day that Tim dreamt of. And you're seriously willing to let me choose whichever one I want? -Really? What do you think I want? -Do you know what, that's too high. -No, no, no, you can have the Wimpey. I think this truck is around ten years old. It's limited edition and sought-after by collectors. -Right, shall we go and grab the box? As with all collectables, packaging is a must. And Tom's kept the boxes and the certificate for his collection. What have you got? You've kept the corgi! this easy-to-lose figurine of the dog from the manufacturer's logo. Thank you, Tom, and seriously, thank you so much. That's a great find, right at the end of the day. Time to add it to our other donations and see how we both fared. Well, Tim, it's the end of the day, the van's been unpacked. Your line is looking very healthy. A lot of quantity. -You look at that line. -I prefer your line to my line. I think there's some potential here. First on the list, a trio ripe for upcycling. and a little tiny cabinet. and maybe feature a bit of detail, a bit of something interesting. -That's going to be the one, isn't it? -You've got a feeling for that. I think that's the easy one to sell but I think that one makes the most money. Now, my star find has to be this easel. It is new, it's brand-new. And now Chris and Steve's kitchen table. A classic bit of retro. 1964, I can date that to 1964, not because I'm an expert! Because Stephen and Chris got that as a wedding gift. That's awesome, that's from them? Now... Item to go off to the sale room. It's not a Singer, but look at the top, it's inlaid, great cabinetry. do the work on that one and hopefully get in between 30 and £40. -That's what I'm hoping. It is a collectable. -in the van because the rain's started. if it's hidden in the van out of the rain. -Collectable's about that, isn't it? -You've got it right, that would fit. -Oh, well, you're the toy man! -I know, I was so excited. -And lorries make top money in toys. It's the number one subject to get for die-cast. I'm going to guide it 30 to 40. -And let's see where that one can go. It could do 80 quid on a good day, if two people want it. -That's it, you got it. -Well done. Get it back in the van, keep it dry. See? Got the right man for the job! I've got some quality there, you've got some quantity there. -We call it a draw because you've worked just as hard as I have. when this community come together and we have more items to sell. everybody loves what this cause is all about. And you know what? and I just hope they turn up. and they turn up because they will have the surprise of a lifetime. But will today's haul be enough to get us to our target? it's the morning of the auction and everyone's getting stuck in. Steve and Chris's neighbours are here to help too. It's OK, shall I just stand here for the day? June's organising the bric-a-brac. Remember Joy? She's at the cake stall. But will they be well enough to join us for their big surprise? Good morning, everyone. Our volunteers. This would not work without you. Tim and I and the team can't do this by ourselves. We're relying on you to have big smiles on your faces. So who's doing teas, coffees and cakes? Grace? You look like teas, coffees and cakes. She does, doesn't she? Who else, who have you got helping you? Karen, bric-a-brac, Peter, bric-a-brac, great. OK, we don't want to be left with anything at the end of the day. We don't want to go home with this bric-a-brac. Everything is pounds. We have to keep it really quiet because they only live just there. But we're hoping to raise £900 here today. That is a big ask. But the community pulling together will make this work. £900. Chris and Steve's neighbours are all pulling together. Providing everyone digs deep, maybe we can get there. -to go and have a pint. -I shall do that and we shall come back later. -Come back a bit later. John will be back, we can count on him. Now, look who's out and about. This is my chance to see how Chris and Steve are doing. But I've got to tread carefully, can't blow this now. -I'm the lady who...you took the table off of. The 1950s table, the Formica one. Was that yours? I remember now. I remember. I remember. Are you helping us out today? -Did you go to hospital? -What did you have done? I gave my husband a kidney. Oh, yes, the penny's just dropped, I remember now. -Is he still in hospital? -He was at the window. -He's up and about already? -I feel absolutely fine. It's amazing, isn't it? -It's not even two weeks yet. -Well, enjoy the day, won't you? -Let's hope it's a success. -Well, it's starting to look all right. But I do think we need more items. Oh, I'll go and have a look. -I'll find you some stock. -I think we got away with that. We got away with that? She's gone to look for more stuff. The community are rallying round. Even more donations are coming in. have been donated by someone on the street. I hope they make £30-£40 on my pop-up auction. Can I auction this off? -Whatever you can get for it. I'm ever so excited now. -for the bedroom for the youngster. -With that lovely bleached top. -Top looks much better, doesn't it? and Irina has done a great job. Well, £10, £10, £15. Hopefully. let's face it, not worth a lot of money, nobody wanted. With a bit of TLC, we've rescued them. but what we're really missing from this street auction is people! Talking to Dan from the local Mini club? Well, they've brought their wheels and they've given me an idea. We should make use of all of these Minis. I'm thinking about a convoy. Huge street auction and street party just around the corner. We want to see all of you there. Come and join us! Well, this estate's certainly not quiet with us around today. But I think this is doing the trick. We're like the Pied Pipers of Hucclecote. And just look how many people have turned up! It's time to get this party started. Tim! Good luck, it's now or never. and everyone looks like they're in the mood for dancing. But best of all, the good folk of Hucclecote are spending their money. £10, sir. Thank you very much. That's great. I hope you enjoy that, but be safe. Ten seconds into the street party opening, so what a great start. Ten seconds, £10 down. We're on it today. I've got a good feeling. That is a great start but we've still a long way to go today. But look - John's been true to his word. He's back and he's brought us his old golf clubs. -That's for us, is it, John? -You're not giving up, though, are you? -No, I've got another set. It's all about teamwork, this. I'm getting new stock in and Tim's busy selling. Right, right. Stand back, stand back! That'll be £10 then, please, sir. -£10. Look, I got it. Thank you very much. That's really good of you. Enjoy that and enjoy the day. thanks to Betty's print of Gloucester. And here's another person I met on the rummage day - Sue. She's bought one of her own creations for us to sell. It really does put a smile on your face and that's what art should do. -I think we could get £10 for that. -Oh, that would be lovely. Perhaps a little bit more on... You know, if everyone's keen to bid. Look, I'm going to put that on the rostrum and thank you very much. I'm going to say, "It's painted by a resident in this street and she's here so don't let us down." that Chris and Steve do - Sarah from the British Heart Foundation. that as soon as that happened, they started fundraising for us. that we desperately need to do, so they're amazing. and that's why we need to hit our target. Time for a tally-up. So, there's around £110 in there. That's brilliant. Right, thank you. Keep up the good work. We've done about £35, £40. -It's a sale of £50 for the table and chairs. -You didn't, did you? Have you just bought them? -Thank you very much. Thank you. Thank you so much. 90. OK, there's £100 in there. Minus 30 for the float, that's 70. So far, we're just shy of our halfway mark for that £900 target. and there's no sign of Steve. I'm going to call their daughter, Claire. -Hi, Claire, it's Paul. We're outside. Hello! I just wondered, how's it going in there? That's good news, cos it means the operation was really successful. Nearly got dropped in it! We are close to the edge on this one. Really close to the edge. that's a little bit worrying. And also, we may get rumbled! Well, we've no choice but to carry on. Aw! Yay! Thank you so much. -I'm collecting all the copper. -No, silver or pound coins! -Oh, bless you. Thank you so much. Tim's getting the last few pounds. He's just sold Paul's chair. -What about... OK, six - meet in the middle. Right, who's got the money? how close we are to reaching that target. items from the rummage day to Tom Keane's saleroom in Tetsworth. First up is Tim's favourite Corgi truck. but Tom's but an estimate of just £10 to £20. Hopefully, we'll get more than the estimate. Is that worth £20 for it? £10 for it? Ten bid. At ten, give me 12. At £10 so far. Give me 12. 12 in, at 12. 15? Do you want 18? 18's bid. Do you want 20? At £22 and going, a cheap lot. Well, it's beaten the estimate but it's still a disappointing start. for us. Its estimate is £20 to £30. £20 for it? £20 for it? 20 bid. At £20, bid 22. Give me 28. At £25 so far. It's sold at £25. All done at 25 and gone. Slap bang in the middle of the estimate. I really hoped for more from our two lots today. So we've added £47 on today's total. -So I need to do £300 on the pop-up rostrum? OK, let's start with lot number one. We have the easel, showing here. so who is going to start me off with a bid of £30? OK. Thank you, straight in. 30. I have a bid of 30. 35. I'm looking for 35. I will sell at 30. Can you make it 35? Can you make one more? 35. Thank you. £35. I love it! He's bidding against himself because no-one else is bidding. Going once, twice. Sold - £35. Thank you. 'Well, thank goodness for Claire's husband Nick. So who's going to start me off with a bid of £5? £5 anywhere? Five, straight in. Five. Is there six? Six, seven now. £7? It's against you now. Can I take 7? £7? Thank you. There's a little eight coming in. Go on, make it ten - I could put the hammer down. £10 showing here now. £10 down the front. I think that's yours, young man. Thank you. That's going straight in the bedroom. It is really a natural history unit. Look at that! It's full of bugs and caterpillars. Who's going to start me off with a bid of a fiver? You will! Thank you. Straight in, young man. Five. Do I see ten? Yes, ten. Any further advances on 15? Fair warning - I'm selling to this young man at £15. 'I hope he's got room in his bedroom for all this. This stuff's all the range right now, it's en vogue. It's really on trend. £10 anywhere? Come on, a vintage Formica table. Five anywhere? Where are the bids? £5 anywhere? Come on! £5, surely. Come on, start me off with five. I'll tell you what - we're going to come back to this one. We're going to skip it but come back. It's a one-off. There isn't anything else like this - it's unique. It's worth investing in. Thank you. £10. 10. 15 at the back. Can I take 20 now? Thank you, £20. 25 now? Go on, one more. 25. Thank you. £25. I'm selling at 25. 'and a couple of last-minute donations sell well. '£50 for these locally made clocks and another £30 for the camera. £5. I've got 5 now. I've got 10. Can I take 15? Yes, 15, 20. 25. Make it 25. Can you make it 21? Make it 21! Thank you. £21. It's going once, twice. Fair warning. Sold! £21. Thank you. 'This is a sweet deal. Keith's snapped it up! Come on, five anywhere? Thank you. Five. Is there six? Can I take six? Come on, can I push this? Six? Six. Five? Five now. I've got £5 and I'll sell at 5. Can I take ten? Six? OK, six. I'll take six. Can I push you to seven now? -Ten? Thank you so much! I like that. £10. Do you know what? I'm going to sell it to you at £10. Sold! 'who's danced in at the last moment. We've beat our target by £5 - hang on, hang on - and 17p. It was that table. Oh, that was close! That was close! -I don't ever want to be this close again. 'We've made it. We've just hit the target we needed for the sculpture. We set out to have a target of £900. That's what we wanted to raise here today with this street party. It was close. It was close. We've worked hard. You've all given plenty. And we managed to raise £905.17. THEY CHEER We just did it! We just did it! believed in this and you did it. because I know it's been the talk of the town. You know, not one deserving person, an unsung hero, but it's two. It's a fabulous couple who live in the heart of your community. a lot but they still keep on giving - OK? - against the odds. They are a special couple. Most of you know who they are. now they're out of hospital. Chris and Steve, all of this is for you. This is your party, OK? "and this is what today is all about. "to create something that shows our thanks for what you do. "at a rather posh restaurant to celebrate your recovery!" -Do you know what? You look great! who gave me a second-hand heart 32 years ago. And my dear wife, who's just given me a kidney! So, thanks, all, very much for coming. -And carry on all your work, all your great charity work. -No intention of giving up. -A big round of applause. It gives me goose bumps and they've fundraised so much. show them how grateful we are for what they've done. we didn't know what was going to happen. I've never seen Dad like that before. I've never seen him well up like that. Very, very few times. So, yes, to see him like that, it's quite nice. And I think for him to say thank you to Mum was good as well. I just knew, at the end of the day, it was going to be close. but we just managed to get away with it! next time and this auction could be for you. Goodbye. is currently being finished at a glassworks in nearby Bristol.